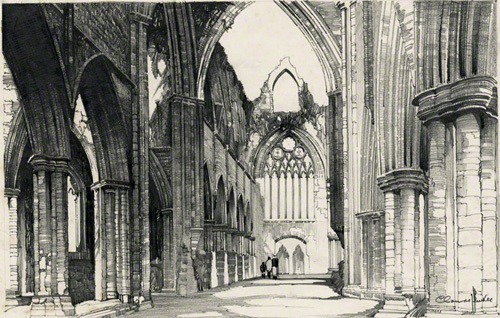 A pencil sketch of Tintern Abbey by Claude Buckle. A view from inside. This is a very detailed pencil drawing of Tintern Abbey from the inside. Claude Buckle excelled at this type drawing and was able to use his architectural drawing skill to perfection. Tintern Abbey (Welsh: Abaty Tyndyrn) was founded by Walter de Clare, Lord of Chepstow, on 9 May 1131. It is situated in the village of Tintern in Monmouthshire, on the Welsh bank of the River Wye which forms the border between Monmouthshire in Wales and Gloucestershire in England. Created in 1935.